Polyglot 3000 is an automatic language identifier that quickly recognizes the language of any text, phrase or even single words. It is available for Windows 95/98/NT/ME/2000/XP/2003/Vista/2008/7. Recognizes more than 400 languages. Can be set to only check for popular languages. 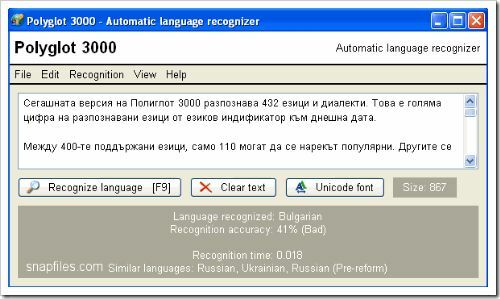 Multilingual interface (English, German, French, Spanish and others).